Belfast boxer Paddy Barnes was among sporting figures from Northern Ireland in the New Year Honours List. Barnes has been appointed an MBE after retaining his Commonwealth Games light-flyweight title in Glasgow in August. Dame Mary Peters, a former Olympic gold medallist, is made a Companion of Honour for services to sport and the community in Northern Ireland. Fifa vice-president Jim Boyce becomes an OBE and Salto Gymnastics Club founder Tony Byrne is awarded a MBE. Boyce, who will step down as Britain's vice-president at world football's governing body in May, was severely injured in a Belfast car bomb in 1972. "I would like to dedicate this honour to the people who kept football in Northern Ireland going through the many, many difficult years," he said. Peters won pentathlon gold in the 1972 Olympics along with two golds in the Commonwealth Games. She became an athletics administrator and has worked on behalf of both sport and the tourist industry in Northern Ireland. Peters, in her position as Lord Lieutenant of Belfast, escorted Queen Elizabeth on a visit to the city in the summer. An MBE award in 1973 was followed by a CBE in 1990 and 10 years later she was made a Dame. 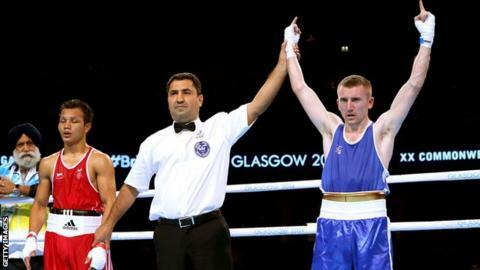 Barnes has excelled as an amateur boxer with the Glasgow gold his latest triumph on the international stage. The 27-year-old was captain of Northern Ireland's Commonwealth Games boxing team, which won an impressive total of nine medals in Scotland. Barnes has also won two Olympic Games bronze medals and a gold in the 2010 European Championships. He described himself as a "proud Irish sportsman" after accepting the royal honour. "I am pleased to have been recognised in the Queen's honours list for 2015 for my contribution to the sport of boxing and for my contribution to work in this community," he said. Byrne founded the Lisburn club, which was the first full-time gymnastics facility in Ireland, in 1982 and was its CEO. Royal Portrush Golf Club secretary and manager Wilma Erskine-Heggarty was among five NI sporting recipients of the British Empire Medal. Swimming coach Robert Madine, Robert Watson of Lisburn Rugby Club and Lawrence Murphy were also awarded the BEM, along with Fivemiletown United Football Club secretary and director of football David McQuigg.